This is a free contest. No entry fee is required. The main contest is held twice a year. Contest dates are January 1 – June 30 and July 1 – December 31. For each contest, we receive between 20,000 – 25,000 poems. Only 65% of these poems will advance to the semi-final round. At the conclusion of each contest, our editorial staff convenes and begins the monumental task of the final round of judging. Please understand, the judging of this contest is just as important to us as it is to you. We read every single semi-finalist poem, sometimes even two or three times. With roughly 15,000 poems to go through, our editors certainly have their work cut out for them! It takes approximately 8–10 weeks to produce the final results. All winners will receive a letter and their prize via regular mail. The first place winner will be contacted by phone or emailed and asked to call our office to verify their identity before their prize is mailed. As soon as the complete list of winners is drawn up, it will be posted on the home page. The poetry contest is held twice per year. Contest dates are January 1 – June 30, July 1 – December 31. Poet information must pass Google API and address verification. Poetry can be written in any poetic style and on any subject. A poem in its entirety must be an original work by the person entering the contest. Plagiarism is a serious offense with serious consequences. Only one poem per person, per household is allowed. Poet must be at least thirteen years of age. All poems must be written in English. Contest entries must be at least 3 but cannot exceed 26 lines (including stanza breaks) and cannot exceed 55 characters per line (including spaces between words). Any submission that exceeds these limits will be automatically disqualified. The poem title does not count as a line. The first word of each line may be capitalized if it is done consistently throughout. Do not use “texting” lingo. Properly spell out all words and numbers. To ensure proper lineation, please use the “Enter” key to start a new line, indicating all intentional line breaks. Do not include your name or any other information at the end of your poem. Both contests award one first place prize of $2,000.00 and a first prize wall plaque ($100.00 value); twenty second place prizes of $100.00 each and a second place wall plaque ($75.00 value); one hundred third place winners of a third place wall plaque and $25 gift certificate redeemable towards any Poetry Nation or Eber & Wein Publishing product ($75.00 value). Sixty to seventy percent of all entries become semi-finalists and receive a certificate of participation suitable for framing. The contest is open to anyone age thirteen and up who writes poetry. Contest entries are judged based on poetic technique, effectiveness, style, and creativity. See our rating system guidelines under Ratings. Contestants who reach the semi-finalist stage of the contest will be given the opportunity to be featured in a poetry anthology. 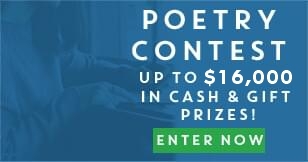 Even poems disqualified from the contest may still be eligible for publication. There is no purchase required to be included in this anthology. There will be no royalties paid to contributors of anthologies. There is a contributor’s discount of $20.00 for pre-publication orders. We only publish one poem per household per anthology. By submitting a poem to our contest, you accept that your poem will appear online and in print. We reserve the right to not publish a poem for any reason. All publications are copyrighted with the U.S. Library of Congress as compilations. All individual poetry remains the property of the author.